One of the nicest things about CFWheels 2.x is the tighter integration with command-line tools such as Commandbox. We can take advantage of the new testing suite JSON return type and the new CFWheels CLI in Commandbox 2.x to easily build a Travis CI test. It’s perhaps easiest to just show the .travis.yml file – this goes in the root of your gitHub plugin repository, and once you’ve turned on testing under Travis.org, will run your test suite on every commit. Naturally, you could do more complex things with this, such as multiple CF Engines, and maybe even multiple CFWheels versions, but for a quick setup it’s a good starting point! Hands up if you’ve ever found a bug in your application..
Upgrades, feature enhancements and bug fixes are all part of the development lifecycle, but quite often with deadlines, it’s difficult to manually test the entire functionality of your application with every change you make. What if there were an automated way of checking if that change you’re making is going to break something? 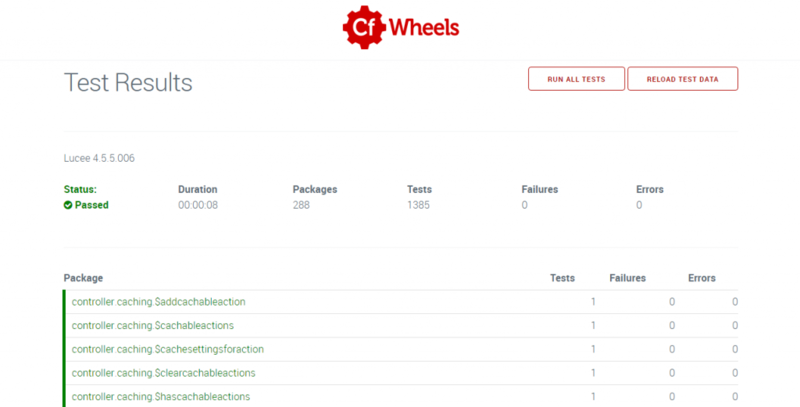 Enter the CFWheels test framework! In the past, writing an automated test suite against your application meant downloading, configuring and learning a completely separate framework. To help address this issue, CFWheels includes a small, simple, yet powerful testing framework. Whilst this has been part of the core in 1.x, it’s never been properly documented, and with 2.x, we’ve introduced lots of new features to help test your application. Here is a simple example of unit testing a helper function that adds two numbers. Once you have a comprehensive test suite, you can make code changes with a greater sense of confidence that you have not introduced bugs (regressions) into your application. This gives you the opportunity to implement automated test runners into a continuous integration platform like Jenkins or TravisCI. Don’t just take our word for it.. well actually, DO take our word for it as CFWheels 2.0 has been developed exclusively against the inbuilt test framework. You get lots of handy information back, like the body contents, the status code of the request, and more. It’s been a while in the making (probably 9 months or more) but we’re finally rolling towards a 2.0 beta release, with just a few tickets in the queue left before we can set it free on the world. In the meantime, you may have noticed a few changes in the CFWheels ecosystem, which we’ve needed to do to support CFWheels 2.x properly. Firstly, all CFWheels domains are now running over https://, which in this day and age, should be a given. No excuses for not doing this now. “docs.cfwheels.org” has been renamed guides.cfwheels.org and is where the main extended documentation and tutorials will live. This system is based on readme.io, and has been great in quickly creating some nice looking docs. We will continue to add to what’s there over the beta launch too. However, it’s not perfect: the API reference on there is simply not designed to take something of the scope of the CFWheels API. The page can crash mobile browsers and is a little…unwieldy at best. Adding to the extremely odd SEO of the reference section (i.e, it’s not indexed at all), it’s time to move it off. So as docs.cfwheels.org has been deprecated, we’re going to split out the API reference to a new home, api.cfwheels.org. There’s lots of good reasons for this: With CFWheels 2.x, not only has the entire core (well, almost the entire core) been moved to cfscript, we’ve also commented every single public API function with javadoc style comments. This means all the core functions you know and love now have been categorized and commented in the source code, so when pull requests come in, we can keep the documentation up to date at the same time. The 2.x core has a new built in javadoc parser, so now we can just extract a JSON file where we can power api.cfwheels.org. This also has a huge advantage – we can offer offline/built in documentation browsers from within the debug section of your app. 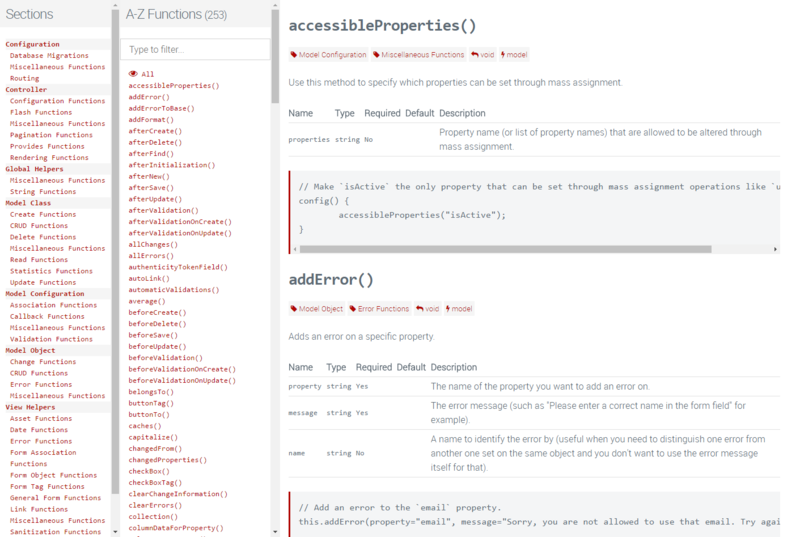 It will even read your own functions – so your local documentation reference will be increasingly valuable. More on this in detail soon. Over the next few weeks, we’ll try and get some blog posts out detailing some of the new 2.x beta features in detail. If there’s something in particular you’d like to know about, please ping a comment or find us in slack/mailing list/gitHub. Also don’t forget to check the upgrade notes. Fix for using cfscript operators in condition and unless arguments. Added try / catch on getting host name since CreateObject(“java”) can be unavailable for security reasons. Fixed bug with cache keys always changing even though the input was the same. Remove white space character in output. Use correct path info in error email and debug area. Fixed plugin injection issue on start-up. Skip calculated properties that are aggregate SQL functions in the GROUP BY clause. Fixed error when trying to validate uniqueness on blank numeric properties.